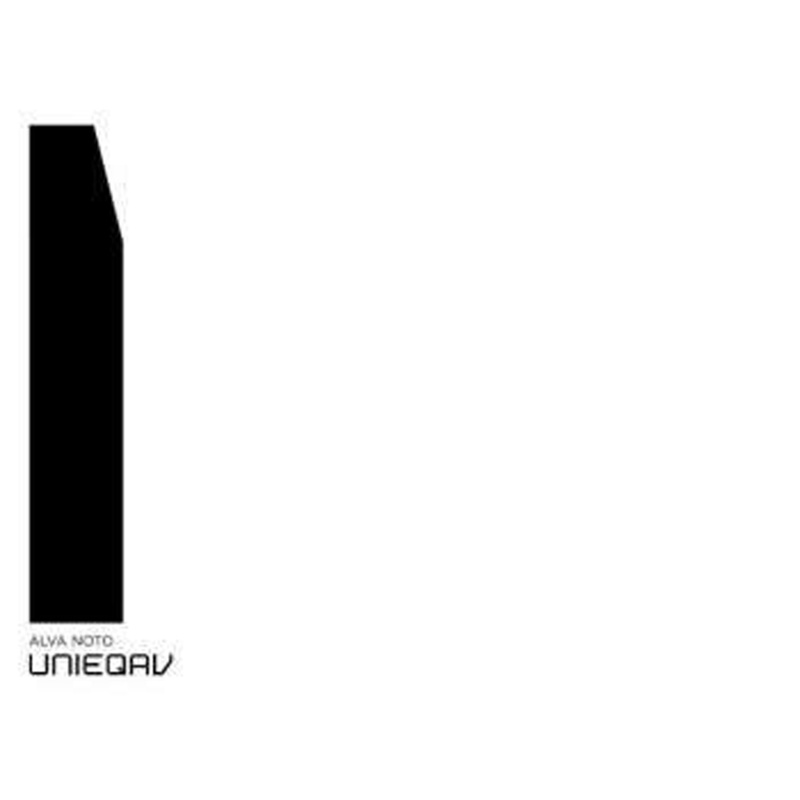 Brainwashed - Alva Noto, "Unieqav"
The final installment of Carsten Nicolai's "Uni" trilogy is a curious addition to the Alva Noto's historically conceptual-minded and experimental discography, as it is essentially a straight techno album. Given that this comparatively dancefloor-oriented series was initially inspired by a trip to Tokyo nightclub Unit, however, I suppose a nakedly beat-driven and somewhat straight-forward album like Unieqav makes some perverse sense (especially as a culminating statement). There is a bit more to Unieqav than mere music though, as the album is part of a larger, more ambitious multimedia work, as Nicolai reportedly floored festival audiences with an intense video onslaught synced to his hyper-precise rhythmic salvos. As a result, Unieqav feels like a somewhat minor release compared to Nicolai's other work when decontextualized from its intended high-volume/sensory overload presentation, but his unparalleled exactitude and clarity still make for a fine minimal techno album. One aspect of Carsten Nicolai's Alva Noto project that I have always appreciated is that each new album is absolutely certain to feature a very clear and coherent vision that has been executed masterfully. Obviously, perfectionism has its downsides too, but that approach lends itself quite nicely to crystalline and cerebral sound art. At worst, Nicolai's vision occasionally errs a bit too much on the side of coldly mathematical to resonate deeply with me, yet his work is always intriguing and distinctive and it is never plagued by half-baked ideas, sloppy craftsmanship, or fits of self-indulgence. Nicolai is the kind of guy that I would probably trust to design a spaceship or expect to pioneer a radical new style of architecture. That is not something I would say of many other artists. On Unieqav, that clear and coherent vision is generally one of futuristic-sounding techno stripped down to just insistently repeating kick drum patterns and a host of machine-like clicks, hums, and pops. The opening "Uni Sub" is a perfectly representative statement of intent, combining a somewhat lurching rhythm with a one-note bass line, subtle mechanical sounds, and a "hook" of gurgling and sizzling noise. There are also some understated synth chords that lurk and undulate in the background, but the most compelling parts of the piece are definitely the textures. It sounds a lot like Nicolai contact mic’d his coffee pot, processed the sounds until they were supernaturally crisp and clear, and then presented them in wonderfully magnified form. The underlying "song" is cool too, but it is essentially just a vehicle to stealthily deliver that textural sorcery, providing the necessary pulse and momentum to keep everything vibrant and purposeful. For better or worse, the remaining 11 songs are all essentially variations on that same template, with the more successful ones being those that offer the more ingenious or striking twists. Much like drone music, minimal techno can often be formulaic and simple to a self-parodying degree, but artists who have the lightness of touch, attention to detail, and genius for subtle dynamic shifts necessary for great minimal techno are a truly rare breed indeed. Nicolai earns his place in that exclusive brotherhood here, as Unieqav is a feast of sharply realized textures and masterfully manipulated rhythms, as Nicolai deftly adds and subtracts cymbals and embellishes his grooves with all manner of squelches, throbs, crackles, scrapes, and sundry other machine-like flourishes. As a result, Unieqav improbably works as both a cutting-edge dance album and a headphone experience that rewards deep-listening. That said, I do especially enjoy the occasional moments where Nicolai eases up on some of his rigorous self-constraints and expands his palette with splashes of harmony or melody. One such piece is the eerily beautiful "Uni Mia," as Nicolai embellishes his pummeling thump with vibrant splashes of laser-like sounds as warm synth clouds fitfully drift through the piece like passing clouds. "Uni Blue" is another more expansive piece, boasting an actual chord progression, gnarled distortion, and quasi-melodic sonar-like pings. To some degree it feels a bit heavy-handed and bombastic in the context of such a uniformly stark album, but that seems to be by design, as the simmering and squelching beat sounds amazing when all the synths fall away. That is quite a neat trick, as having that veil pulled away like that forced my complete focus onto Nicolai's dazzling rhythm (it is very easy to become numb to the more inspired bits of an uncompromisingly beat-driven album unless they are ingeniously framed). Elsewhere, the closing "Uni Chord" is another highlight, as dreamily melancholy synth drones unfold over a wonderfully twitching, shivering, and stuttering beat. As a long-time Alva Noto fan, it is quite hard to separate my opinion of Unieqav from my deeply entrenched personal expectations, as it is definitely a bit of an outlier. It is too one-dimensional and stripped-down to feel like a great Alva Noto album, yet the complex and inventive beats make this an excellent album by minimal techno standards: Unieqav easily holds its own when stacked up against classic Chain Reaction or Mille Plateaux fare and I love that stuff. I suppose I just have a nagging regret that Nicolai did not take this opportunity to break new ground by more aggressively synthesizing his love of techno with his genius for experimentalism and unconventional sounds. That imaginary album would have been a bit more compelling that this relatively straight homage, but Unieqav is nevertheless a stellar homage, succeeding as both a dance album and a master class in dynamics and sound design.